Mahatma Markandeya explained further to Dwijottama Koushtik the features of Bharata Varsha as follows: Bharata Varsha comprised nine parts viz.Indra Dwip, Ksheruman, Tamravarna, Soumya, Gabhastimaan, Naga Dwipa, Gandharva, Vaaruna and Bharat. The ninth segment Bharat is surrounded be Oceans, its Eastern side by Kiratas, Western side by Yavanaganas and in the middle region are the Chaturvarna or four classes of Brahmana, Kshatria, Vysya and Shudras, performing their respective Varna Dharmas or the prescribed duties like Yagnas by Brahmanas, Kshatriyas of Administration and Defence, business and trading by Vyasyas and Shudras of Service and become eligible for attaining Swarga, or Moksha or reap the fruits of sins or virtues. There are Seven ‘Kulaachalas’ or Mother Mountains viz. Mahendra, Malaya, Sahya, Shaktiman, Kaksha, Vindhya, and Paariyatra and thousands of ‘Upa Parvatas’ like Kolaahal, Mandara, Dardura, Vaataswana, Vaidhyuta, Mainaaka, Swaras, Thungaprastha, Naagagiri, Rochana, Paandura, Pushpa, Durjjayant, Raivatak, Arbuda, Trashyamuka, Gomanta, Kutashaila, Krutasmara, Sriparvata, and Chakoraparvat, which are all very high, wide and broad. These massive Mountains and surroundings are the inhabitants of Mlecchhas or Aryans, utilising the various rivers adjacent for drinking, farming and other purposes like Ganga, Saraswati, Sindhu, Chandrabhaga,Yamuna, Shatadru, Vitasta, Iravati, Kuhu, Gomati, Bahuda, Dhutapapa, Drushadvati, Vipaasha, Devika, Ramkshu, Gandaki and Kaushiki; these are all from the Himalayas and around. Those rivers from Pariyatra Mountains include Vedasmriti, Vedavati, Vena, Vritraghni, Saanandana, Sadanira, Mahi, Para, Charmanyavati, Nupi, Vidisha, Kshipra, and Avanti. Mahanad sona and Narmada originated from Surataadri. Mandakini and Darshani Nadi are from Chitrakuta Parvat.Godavari, Bhimaratha, Krishna, Venya, Tungabhadra and Kaveri emerged from Vidhyachala. From Malay Mountain came Kritamala, Tamraparni, Pushpaja, and Utpalaavati. Additionally, there are innumerable well known and not so well known rivers dotting all over Bharata Varsha. 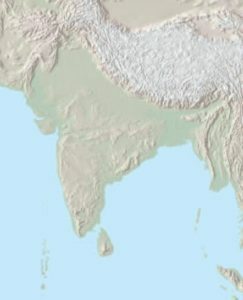 As regards the territories in Bharata Varsha, the Northern part comprised Kamboja, Darada, Barbara, Angaloukika (Harshavardhana), Cheena, Tushara, Tamasa, Hamsamarga, Kashmira, Shulika, Kuhaka, Urna, Darwa etc. On the Eastern side, the territories included Angaraka, Mudraka, Antargiri, Bahirgiri, Plavanga, Mala, Damala, Vartika, Uttarabrahma, Pravijaya, Bhargava, Geyamallaka, Pragjotisha, Madra, Videha, Tamraliptaka, Malla, Magadha, Gomeda and so on. In the South of Bharata Varsha, the territories included Pandya, Kerala, Chola, Kruntya, Kumara, Vanavasaka, Maharashtra, Maahishika, Karnataka, Kalinga, Aabhira, Vaishikya, Atayva, Pulinda, Vindhya, Maaleya, Vaidarbha, Dandaka, Pourika, Moulika, Ashmak, Bhogavardhana, Naishika, Kuntala, Andhra, Udbhida, Vanadaraka, etc. On the North East, Taxila, Koshala, Tripura, Vidisha, etc. on the West, Saurashtra, Anantya, Arbuda etc. and on the South East, Utkala,Uktamarna, Dasharna, Bhojya, Kishkindhaka, Tumburu, Tumbula and Naishidha. Markandeya explained to Dwijavar Kaushtik that Bharat Varsha was a ‘Bijaswarupa’ or the form of various seeds which had Brahmatva, Indrastva, Devatva and Manushyatva or of the features of Brahma, Indra, Devas and Human Beings respectively. Among the various worlds, Bharat Varsha happened to be of the ‘Kurmarupa’ (Tortoise Avatara) of Bhagavan Vishnu comprising the various Territories spread out in various directions mentioned as above. Also, Bharata Varsha is a Karma Bhumi as Human Beings are capable of achieving anything some of which are perhaps not in the reach of even Devas or Danavas! This is so since humans could conquer innumerable hurdles, even without the infrastructural support that Devas and Danavas are blessed with; human beings excel themselves by the dint of their hard work coupled with inherent originality and diligence.